Almost wiped from history for 3,000 years, a lucky find brought the boy pharaoh, Tutankhamen (reigned c1336 - 1327 BC), into public view. But questions still persist about his short life and mysterious death. When Akenhaten died, he left his country in a bad state. His experiment at Amarna was over. His religious extremism had left his dynasty, country and empire staring disaster in the face. And his heir was just a 9-year-old boy - Tutankhaten. The boy was Akenhaten's son by a minor wife. He grew up in the palaces at Amarna worshipping Aten, the sun god. 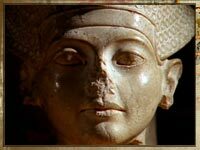 Even his name meant 'the living image of Aten'. As a young boy he was not in control of his own throne. The military and priesthood had seen their influence decrease under Akenhaten. They seized the opportunity to use the young pharaoh as their puppet in order to return Egypt to its traditional ways and religion. The first thing they did was change his name. Tutankhaten became Tutankhamen, meaning 'a living image of Amen'. They then wrote a decree for Tutankhamen where he publicly blamed his father for neglecting Egypt's traditional gods and plunging the country into chaos. He ordered that the old gods and temples be restored, along with the power of the priests. Amen-Re would take back his place at the head of the gods and Aten was relegated back to his formerly minor status. Amarna was abandoned and nobody was allowed to speak of the heresy that had taken place during Akenhaten's reign. It was erased from official history, as if it had never happened. 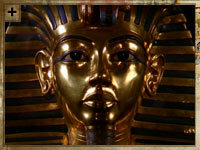 By the time Tutankhamen was 19, and able to rule by himself, everything seemed to be back to normal. But then he died - suddenly and mysteriously. Some think he was murdered in a plot to seize the throne. One suspect is the court advisor Ay. He was the main driving force behind the restoration of the old religion and he went on to rule Egypt. During this time, he ordered a more vicious rejection of Akenhaten and his sun-worship, in which many references to the dead Pharaoh and his queen, Nefertiti, were destroyed forever. Tutankhamen would have remained just a scribble in the margins of history but for a British archaeologist named Howard Carter. 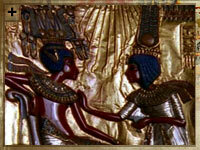 In 1922, Carter discovered Tutankhamen's tomb in the Valley of the Kings, untouched for 3,000 years. The tomb held thousands of treasures and a fabulous quantity of gold - so much, in fact, that it took Carter and his team 10 years to empty the tomb completely. After 3,000 years, nobody really knows how or why Tutankhamen died, but this death marked the end of Egypt's most powerful dynasty and the beginning of a period of great uncertainty.